Fiction: The B-2 Strikes on North Korea. By Tom Demerly for ALERT 5. 22:50 HRS Local, May 12, Knob Noster, Missouri; Whiteman AFB: Hold short, Runway 1/19. In one of very few instances since August 9, 1945, a U.S. bomber armed with a nuclear weapon for a strike against an enemy was preparing for take-off. The B-2 stealth bomber, serial number 93-1086 named “Spirit of Kittyhawk” from the 13th Bomb Squadron, 509th Operations Group, taxied to the hold short at the far end of runway 1/19. It is the longest runway at Whiteman AFB in Missouri. Two U.S. Air Force 2W2X1 nuclear armament technicians and two civilian contractors from Raytheon Missile Systems performed final diagnostics on the AGM-129 nuclear armed Advanced Cruise Missiles via a data link to the weapon. The targeting data was quadruple checked: Primary target: the plutonium production reactor at Yongbyon, north of Pyongyang, North Korea. After forty minutes of preflight checklists and weapons verification the giant flying wing rolled gracefully down the runway with gathering speed and slid into the night sky. It was headed north and west for the arctic and its holding area. It would perform a long duration loiter with tanker support until it was recalled, its endurance limit was reached (and its chemical toilet filled) and was replaced by another nuclear armed B-2, or it was directed inbound toward Yongbyon for a nuclear strike. Kittyhawk and her nuclear strike component was the “Plan B”. “Plan A” was already well underway. Hours before B-2 numbers 82-1066, “Spirit of America” and 82-1071, “Spirit of Mississippi” left on a similar navigational track but were armed with conventional GBU-57B Massive Ordnance Penetrator weapons. Each aircraft carried two giant 15-ton conventional bombs. Spirit of America was targeting a secret cyber warfare complex at Hamhŭng along the Sŏngch’ŏn River while Spirit of Missouri would strike the Yongbyon nuclear complex in advance of a potential nuclear strike by Kittyhawk. The B-2 is the most expensive combat aircraft in history. And the most impressive. Its systems are so advanced it can hit targets with uncanny accuracy, frightening lethality and unnerving invisibility anywhere on earth with impunity. It is the one U.S. weapons system every adversary fears. Hence its value. It is a maintenance intensive aircraft, but it offers capabilities nothing else comes close to. 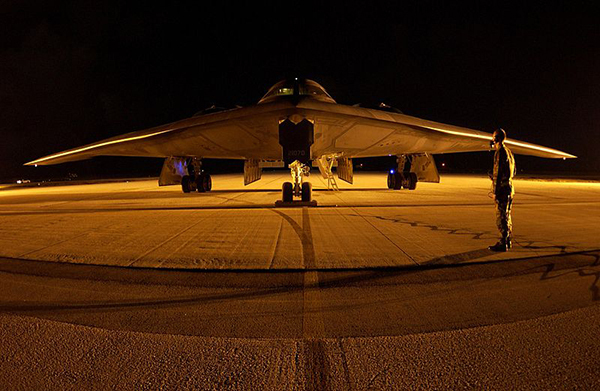 The crews that fly and maintain the B-2 are among the most elite in the history of flight. More men have been to space than are authorized to fly the B-2. All those facts being true the B-2 mission is a boring one most of the time. The America and Mississippi tracked mostly north and partially west over the United States toward the Alaskan coast flying an approximation of the famous Polar Route. It was quiet and routine inside the cockpits. The two person flight crews made up of the aircraft commander and mission commander chatted about the weather, what the upcoming crew rotation would be like and the moon phase. That topic lead to a conversation about the Hasselblad cameras that the astronauts had left on the moon during the Apollo missions. Work in the cockpit became more focused once the aircraft crossed Alaska. The course varied slightly left, avoiding Russian air space and tracking over the easternmost Sea of Okhotsk. The mission commander depressed a console button with the acronym “PEN” for “penetration mode”. Another weapons’ status was run and checks were made of special secure communications equipment. The flight computer’s pre-programmed mission profile changed the altitude and speed of the aircraft from an emphasis on endurance to an emphasis on stealthy infiltration of North Korean airspace. The aircraft commanders in both aircraft selected a document called “Attack Checklist”. At almost the same instant as the strike on Hamhŭng, the nuclear facility at N’yongbyon was hit by an American B-2. 19:31 Hr.s Local (UTC +9), May 12, Hamhŭng, North Korea, Headquarters, Korean Peoples’ Special Information Intelligence Directive, “Unit 10421”. The air defense ring around Hamhŭng bears a great resemblance to the one around Baghdad prior to the first Gulf war. It is an integrated system with communications links between weapons systems and radars. It combines anti-aircraft guns for low altitude targets and many surface-to-air missile systems for higher altitude targets. Targeting information is shared between gunnery assets, to include missiles, creating complete, interlocking coverage up to 60,000 feet above the city. It is a lethal labyrinth of sensors and weapons all working in conspiracy to deny the airspace to the enemy. From out of the east, north and south a salvo of Tomahawk cruise missiles converged from three directions. They traced their robotic flight paths just above high-rise apartments and terminated on radar and communications with explosions that ranged from very small to enough to destroy a small building. Unlike the CNN video of Baghdad at the beginning of the Gulf wars there was little random anti-aircraft fire. The North Koreans knew better, and their equipment had advanced since then. While sirens blared across the city it was decidedly less dramatic than what people had experienced in the Middle East. Even if it were a spectacle, there was no CNN, BBC or MSNBC cameras there to record it. As the anti-aircraft fire control centers and their attendant batteries maintained fire discipline the Spirit of Mississippi attacked Hamhŭng at medium altitude from the west, the least likely and least defended ingress route. Computers, inertial navigation systems and a device that inspected the sky above and compared it to the aircraft’s position verified the approach, locked in the best weapon release point and prepared to drop. The big faceted bomb bay doors opened quickly and both giant Massive Ordnance Penetrators left the aircraft. Unlike the usual pull-off from target by most strike aircraft the B-2 flew straight and level without a change in altitude, relying on its low-observable technology and the confusion of the enemy air defense suppression strike to protect it during its egress from the target area. The sky was barely dark enough to not be able to see the aircraft. Both GBU-57B Massive Ordnance Penetrators pierced the roof of a low, glass office building and tore into concrete above the subterranean computer intelligence and hacking unit. The impact sent a seismic shockwave through the ground, like a localized earthquake. The only sound, at first, was the shrill whistle of their terminal approach, then a brief ringing crack from impact and an ominously low rumble you seemed to feel more than hear. Windows burst inward for a city block. For the briefest instant all was silent. Then the ground seemed to oddly collapse under the building the way a sinkhole forms. The depression spread outward in waves as the building folded inward and, before the shockwave reached its ultimate diameter a flaming monster burst from the sunken ground. It shrugged broken glass, chunks of concrete, earth and debris from its back, then roiled upward into the night sky, casting rotating shadows that seemed to flee from it, and disappeared. Out over the Northern Pacific the flight crew of the nuclear-armed B-2 Spirit of Kittyhawk received its recall code via secure satellite communications. While they would never admit it, both crew members said a silent thank-you prayer as the aircraft left its orbit and began the flight back to Missouri. Authors Note: While I do write for a living I don’t write fiction for a living. I do rely heavily on the inspiration, friendship and research of a number of people for short story projects. Some I can talk about, others not. Tom Demerly has written for "Outside", "Velo-News", "Bicycle Guide", "Bicycling", "Inside Triathlon", "Triathlete", "Triathlon Today! ", "USA Triathlon Magazine" and many other publications. He has raced endurance events on all seven continents and climbed the highest mountain on three. Demerly is four-time Michigan USA Cycling Champion and has completed over 250 triathlons around the world, Including the Ironman World Championships in Kona, Hawaii. In 1990 Demerly raced for the Nike/Velo-News/Gatorade Cycling Team in Belgium. His military experience includes being Honor Graduate from the U.S. Army Infantry School at Ft. Benning, Georgia and as a Scout Observer for Company "F", 425th INF (RANGER/AIRBORNE), Long Range Surveillance Unit.